Sunday Stalwarts and God-and-Country Believers tend to be Republicans, while Religion Resisters, the Solidly Secular and the Spiritually Awake are generally Democrats. The other two groups are somewhat more mixed in their partisanship. These patterns also are reflected in differences among the typology groups on a variety of political and social issues. When it comes to views of President Donald Trump, the nonreligious typology groups are strong in their disapproval of the job he is doing as president. Sunday Stalwarts, meanwhile, are about evenly divided between those who approve and disapprove of Trump, and God-and-Country Believers are the only group in which the balance of opinion leans more toward approval than disapproval of Trump’s performance as president. God-and-Country Believers also are much more inclined than other typology groups to view immigrants as a threat to the country’s values. Sunday Stalwarts stand out for being more likely than other typology groups to vote in local elections. At the same time, Sunday Stalwarts are no more likely than other groups to be civically engaged in some other ways, including by donating money to a candidate or volunteering for a campaign. The nonreligious groups (Religion Resisters and the Solidly Secular) are more likely than most other groups to have a negative view of the federal government. They also generally say the government should do more to solve the country’s problems (as opposed to leaving it up to businesses and individuals to solve the country’s problems). The survey shows, furthermore, that clear majorities of both nonreligious typology groups say human activity is causing global warming, and that the country should do more to achieve racial equality. In addition, Religion Resisters are the most likely to say the country has not gone far enough in giving women equal rights with men. The survey also asked about a few personal actions and behaviors – having an abortion, engaging in homosexual behavior and drinking alcohol – that may be seen through a moral lens. While most Sunday Stalwarts and God-and-Country Believers see abortion and homosexuality as morally wrong, substantial shares of most other groups say these are not moral issues at all. Six-in-ten Sunday Stalwarts and God-and-Country Believers (59% each) identify with or lean toward the Republican Party, compared with 41% of the general public. Among all the religious typology groups, these two are the most likely to identify with the GOP. Ideologically, these two groups are also the most likely to identify as politically conservative. 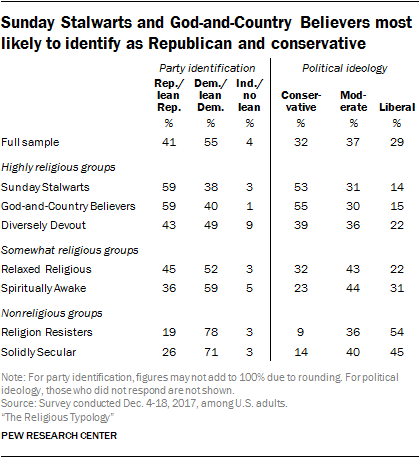 In total, about half of Sunday Stalwarts and God-and-Country Believers say they are conservative (53% and 55%, respectively), while roughly three-in-ten say they are moderate (31% and 30%) and fewer identify as liberal (14% and 15%). Religion Resisters and the Solidly Secular, meanwhile, are overwhelmingly Democratic in their orientation – with seven-in-ten or more in both groups identifying with or leaning toward the Democratic Party. These groups are the most likely to describe themselves as political liberals and the least likely to say they are conservative. God-and-Country Believers are the only religious typology group in which people tend to approve of the way Donald Trump is handling his job as president, with 58% approving and 41% disapproving. Sunday Stalwarts are roughly evenly divided: 50% approve of Trump’s job performance, while a similar share (48%) disapprove. The nonreligious groups are particularly critical of Trump: Just 15% of Religion Resisters and 26% of the Solidly Secular approve of the president’s performance. 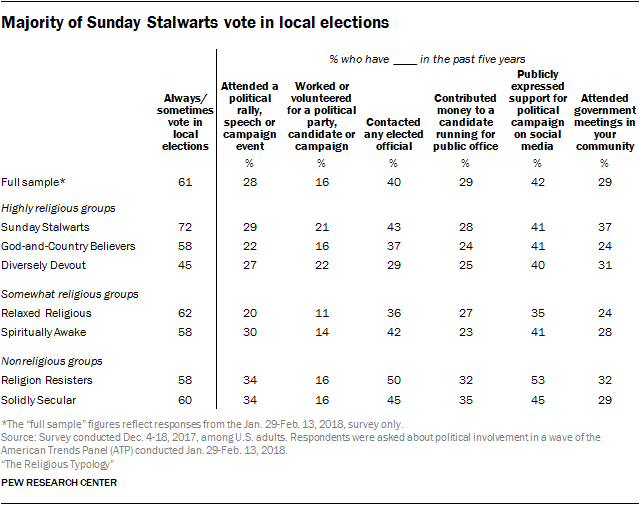 Sunday Stalwarts are the most likely of any group to cast a ballot in local elections, with nearly three-quarters saying they always (46%) or sometimes (27%) vote. Meanwhile, the Diversely Devout are much less likely than any other group to always or sometimes vote in local elections, with only 45% saying they vote that often. Sunday Stalwarts also are somewhat more likely than most other typology groups to say they have attended government meetings in their community in the past five years. But they are not more likely than most other groups to have attended a political rally, worked or volunteered for a candidate, contacted an elected official, contributed money to a candidate, or publicly expressed support for a political campaign on social media in recent years. 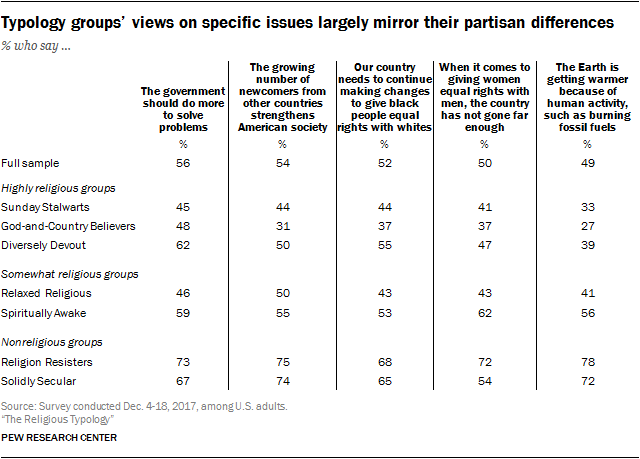 By and large, on a number of questions about specific issues involving government and society, the differences among the typology groups mirror their partisan alignments. For example, the nonreligious groups tend to express liberal views on these issues, such as that the government should do more to solve problems, and that the country needs to continue making changes to give black people equal rights with whites. There is a notable gap between the nonreligious groups on the question of whether the country needs to do more to give women equal rights with men. While a clear majority of Religion Resisters (72%) say there is more work to be done in this area, only about half (54%) of the Solidly Secular – who are 65% male – take this position. Sunday Stalwarts, God-and-Country Believers and, to a lesser extent, the Relaxed Religious are much less likely to take these positions or to affirm that the Earth is getting warmer because of human activity, such as burning fossil fuels. And God-and-Country Believers are the least likely of any group – even compared with Sunday Stalwarts – to say the growing number of newcomers from other countries strengthens American society. Fully two-thirds in this group take the opposite view, saying instead that immigrants threaten traditional American customs and values. About half of the general public (48%) says having an abortion is morally wrong. Smaller shares say the same about homosexual behavior (34%) and drinking alcohol (13%). Compared with other typology groups, the highly religious groups are especially likely to oppose all three of these actions or behaviors on moral grounds. Indeed, strong majorities of Sunday Stalwarts (82%), God-and-Country Believers (75%) and the Diversely Devout (68%) believe that having an abortion is morally wrong. By comparison, only 15% of Religion Resisters and 18% of the Solidly Secular agree. The somewhat religious typology groups fall in between. Both of the nonreligious groups are more likely than other typology groups to say having an abortion is morally acceptable, and substantial shares of both groups (53% of Religion Resisters and 39% of the Solidly Secular) say that abortion is not a moral issue at all. When it comes to homosexual behavior, Sunday Stalwarts and God-and-Country Believers are the most likely to say it is morally wrong (72% and 68%, respectively). Four-in-ten members of the Diversely Devout also say homosexual behavior is morally wrong, although six-in-ten say either that it is not a moral issue (38%) or that it is morally acceptable (22%). Large majorities of the four other typology groups agree that homosexual behavior is either morally acceptable or not a moral issue. Meanwhile, large majorities in all seven groups say drinking alcohol is either morally acceptable or not a moral issue. Again, however, the highly religious groups are somewhat more likely than others to say it is morally wrong, with roughly a quarter of God-and-Country Believers (26%), Sunday Stalwarts (25%) and Diversely Devout (22%) taking this position.